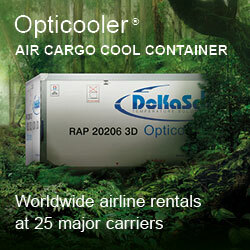 IN BRIEF - THE LATEST AIR CARGO INDUSTRY NEWS. LH Cargo has come up with yet another strategic cooperation. 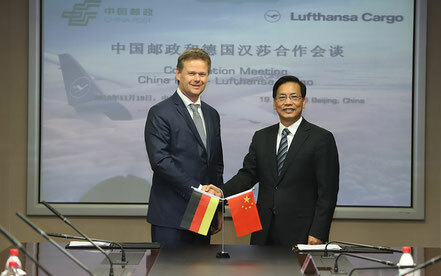 They announced last week that China Post Group Corporation, which is China’s official postal service, and Lufthansa Cargo have inked a strategic cooperation which is aimed at strengthening their present ties. The agreement was signed in Beijing at a ceremony attended by Mr Li Xiong, Vice President of China Post Group and Peter Gerber, CEO and chairman of the LH Cargo executive board. In a press statement LH Cargo says that “initially, the agreement has a weekly scope of the cargo capacity of one Boeing 777 freighter on the Shanghai (PVG) - Frankfurt (FRA) route.“ At the ceremony both parties stressed that they were looking at further close cooperation and other new agreements together. A cooperation already exists between LH Cargo and China Post which is centred mainly around Beijing and Guangzhou stations. 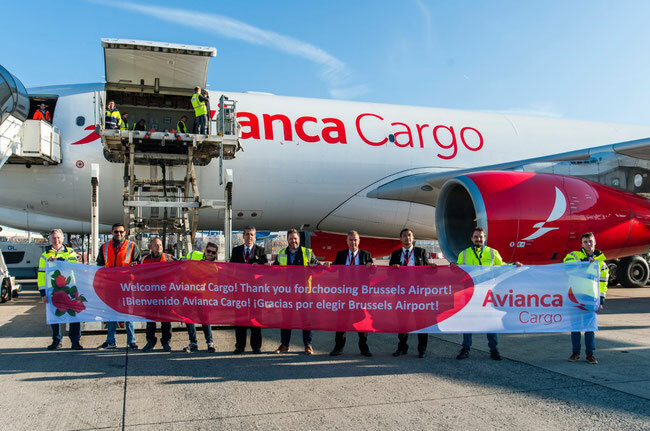 The Colombian carrier Avianca Cargo has chosen BRU for its first European route from Bogota, initially with one weekly flight via Miami. As of December a second weekly rotation will be added. The company deploys one of its six A330-200Fs on the route. Incoming cargo at BRU will mainly be perishables. 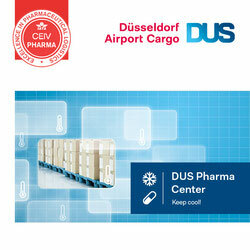 On the return leg the aircraft will carry general cargo and pharmaceuticals. Cargo handling has been awarded to WFS, and Swissport takes care of airside handling. Avianca’s Brussels GSA is Cargobase. Apart from this new freighter service, Avianca also has passenger services from Madrid to Medellin and Bogota, London-Heathrow and Barcelona to Bogota and since this month also from Munich to Bogota. Earlier this year the carrier hinted at further expansion in the European market. Avianca’s new BRU service is the airport’s second connection with Latin America. Last April LATAM Cargo moved two of its AMS flights to BRU. From there the aircraft fly to Frankfurt and onto Sao Paulo, returning to Europe via Santiago de Chile. This routing has in the meantime been upgraded from initially one frequency to three flights per week. Swiss-based CEVA Logistics which recently admitted to disappointing third-quarter figures, has announced the appointment of two new managers. Guillaume Sauzedde takes up the newly created position of Managing Director of CEVA’s Germany and Eastern & Central Europe cluster. Mr Sauzedde is presently MD of the Eastern & Central Europe operation and in addition now takes up responsibility for Germany. With this move CEVA intends to create closer synergies by operating in the region with just one, instead of two clusters. On the other side of the globe, CEVA has appointed Milton Tadeau Pimenta as MD of CEVA Logistics Australia & New Zealand operation. Mr Pimenta takes over from Carlos Velas Rodriguez who is said to be leaving CEVA in order to pursue a different career. Pimenta, who is currently CEVA’s head of Contract Logistics in South America will move to Auckland as of 1. January 2019. As we previously reported, the Air Transport Services Group (ATSG) were planning to take-over Tulsa, Oklahoma-based passenger carrier, Omni Air International. The acquisition has now been completed and it is said that the purchase price was US$845 million. ATSG which has a fleet of B767 freighters operated by daughter companies ABX Air and ATI - Air Transport International, has it seems decided to take Omni Air as they operate a fleet of thirteen older B767 passenger aircraft which are seen as being valuable feed-stock for ATSG as P2F freighter configurations. Which newer aircraft model Omni would then be equipped with in order to continue their ACMI and charter passenger business, remains to be seen. Omni International also operates military passenger charters on behalf of the U-S. Department of Defense Civil Reserve Air Fleet (CRAF). ATSG subsidiaries, ABX and ATI operate their B767F fleets mainly for Amazon Air. It looks like the Swiss Post has finally found a permanent CEO. They have announced that Roberto Cirillo will take up the CEO position as of 1. April 2019. The Swiss Post CEO position has been in somewhat of a limbo since Susanne Ruoff resigned in June of this year. Since then, Ulrich Hurni who is head of Post Mail at Swiss Post has been acting as interim CEO. Roberto Cirillo is presently a member of the board of directors at British chemicals manufacturer, Croda International. Mr Cirillo started his career with the McKinsey Group in Zurich and was also CEO for four years at Optegra, an international hospital group. As has often been reported over the past twelve months, Budapest Airport is investing considerable sums in expanding their facilities, especially those on the cargo side. The airport released figures which show that October air cargo tonnages increased by almost 23% compared on the year before. A total of 13,313 tonnes moved through the cargo area in October. Year-to-date figures also show a continued upward swing on the cargo side. January to October tonnages were 120.603 tonnes, up 16.3% over 2017 figures. Total tonnage for 2017 was just over 127,000 tonnes and Rene Droese, Executive Director Property and Cargo at BUD states that this figure has already been surpassed and the airport expects a total of 150,000 tonnes by year end. 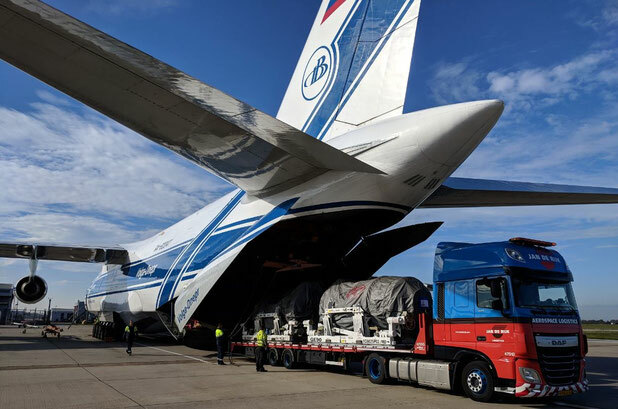 GECAS which is one of the largest, if not the largest leader in aviation leasing and financing recently chose Volga-Dnepr Airlines to transport two very large General Electric GE-90 aircraft engines between Dallas, Texas and London. The combined weight of the engines and accompanying spare parts totaled 64 tons. The engine dimensions made it necessary for GECAS to charter the large Antonov AN-124 freighter for the transport. Each engine weighs in at 12 tons and is seven-and-a half metres in length and almost four metres in width and height. The main cabin of the AN-124 was filled completely with the voluminous 64 ton payload. GECAS could turn out to be a new long-term customer for Volga-Dnepr as aircraft engine dimensions are growing larger with the introduction of new longe-range aircraft and do not fit even into the large main-decks of B747 freighters.